Businesses commonly face lawsuits accusing them of having received a fraudulent transfer. Join bankruptcy law experts Michael Brandess (Sugar Felsenthal Grais & Hammer LLP) Brett Amron, Teresa M. Pilatowicz (Garman Turner Gordon LLP), Lisa Vandesteeg (Levenfeld Pealstein, LLC) as they explain this complicated area of the law in plain English. Bankruptcy trustees bring these actions with some frequency; if you or your clients deal with companies that have filed or may file for bankruptcy, they could be targets. Webinar sponsors are Eisner Amper and Chapter 11 Dockets. The Commercial Law League of America (“CLLA”) is a respected organization of attorneys and other experts in credit and finance actively engaged in the field of commercial law, bankruptcy and insolvency. Wauconda, 7/15/2015 – The Commercial Law League of America (CLLA) and the International Association of Commercial Collectors, Inc. (IACC), announced today the update of the CLLA agency certification logo. This logo represents the power and prestige of the recent alliance between the two organizations. The logo update was inspired by the recently improved certification program and the affiliation and endorsement by IACC. “The response from IACC members coming into CLLA’s program has been excellent. We are processing this year’s recertification applications and are pleased with the results. Both organizations are marketing the program to credit providers across the service and manufacturing industries, said Robert S. Bernstein, CLLA President. To become Certified, CLLA’s program requires commercial collection agencies to be bonded, financially secure, able to pass an on-site audit, and in compliance with all Federal regulations. Certified agencies must recertify each year and submit to reviews regarding adherence and compliance to the standards of the program. For more information about the Certification program, to apply for Certification, or to locate a Certified Agency please visit CLLA online at www.clla.org/certification . (MINNEAPOLIS, June 8, 2015) The International Association of Commercial Collectors (IACC) has launched B2B Collections, a free electronic source of news, features and other information targeted to the specific needs and interests of commercial creditors, commercial collectors and those in related industries. Each month, B2B Collections contains interesting and informative articles pertaining to commercial collections and credit and the points where they intersect. “We plan to grow this publication into a go-to clearinghouse of news and ideas on our industries, one that is responsive to our audience,” said IACC President Tom Brenan, president of Altus Global Trade Solutions, Inc., one of the largest receivables management firms in North America. Some of B2B’s content will be written by IACC members or staff, and some by contributing writers who are experts in commercial credit. This new publication has reported on the skills and personality traits necessary for success in the collections industry, as unearthed by IACC’s recent Pulse of the Profession Survey. It also offered practical advice on recognizing when accounts should be referred to a commercial collector and how to negotiate the process of switching a slow-paying customer from credit to cash-in-advance billing. MINNEAPOLIS (June 3, 2015) – The International Association of Commercial Collectors, Inc. (IACC) will host its annual Mid-Year Conference 2015 at the Boston Sheraton, July 17-19, 2015, where higher level commercial collection professionals will meet to learn and discuss new ideas to strengthen their business strategies. This year’s conference will focus on marketing strategies for reaching that target prospect, compliance, using technology to work better, international fee arrangements, managing your multi-generational staff, hot topics and more. In addition, the Mid-Year Conference provides ample opportunities for networking including a Boston Beer Works Tour and dinner as well as the famous Boston Duck Tours. To download the registration form online, visit the IACC website. For more information on the IACC, b2b collection and the upcoming Conference, visit the IACC website or call (952) 925-0760. The International Association of Commercial Collectors (IACC) is an international trade association comprised of more than 350 commercial collection agencies, attorneys, law lists and vendors. With members throughout the U.S. and in 25 international countries, IACC is the largest organization of commercial collection specialists in the world. The IACC contributes to the growth and profitability of its members by delivering essential educational and professional tools and services in a highly collaborative and participatory environment. Chicago 5/20/2015 — The Commercial Law League of America has named Warren Pinchuck, CEO, Columbia Financial International, Inc., as the 2015 President’s Cup award recipient. Mr. Pinchuck, Past President of The Columbia Law List, graduated from Brooklyn College in June 1956 with a BA in Economics. Mr. Pinchuck served 2 years in the military before beginning his career. Originally from the East Coast, Mr. Pinchuck currently resides in Boca Raton, Florida. Mr. Pinchuck, a Lifetime Member of The Commercial Law League of America, has held several key positions in the organization. A 3 Time Member of the Board of Governors as the Law List Publishers Representative, and Past Chair of the Eastern Region, Mr. Pinchuck has been a dedicated CLLA member. Currently, he is serving as the Eastern Region Arrangements chair and working to plan the Fall Conference which will take place in November in NYC. Mr. Pinchuck is also an active member of the Association of Law List Publishers. CLLA presented the award to Pinchuck at its 2015 National Convention, held from April 29 – May 2, 2015 in Las Vegas at the legendary Caesars Palace. President’s Cup winners are selected by a special committee comprised of CLLA board members, a previous President’s Cup recipient and a member of the American Lawyers Quarterly law firm directory. Since 1964, the award has been presented to a CLLA member who has shown outstanding service to the organization, in addition to leading a respected personal and professional life. For more on Pinchuck and the Columbia List, visit www.columbialist.com. IRVINE, Calif., June 8, 2015 — Gregory Shaffer, Chancellor’s Professor of Law and Director of the Center on Globalization, Law, and Society (GLAS) at the University of California, Irvine School of Law, has been selected for a prestigious Shimizu Visiting Professorship at the London School of Economics for October 2015. The Shimizu professorship is awarded each year to three prominent individuals from around the world who stay at LSE for a two-week period. The objective is to enrich the intellectual life of LSE’s Law Department and to expose its graduate students to the work of leading scholars. As a Shimizu Professor, Shaffer will give public lectures and meet with faculty and graduate students regarding their work. The London School of Economics is recognized internationally for its top-ranked research faculty in the UK. A Chancellor’s Professor at UCI, Shaffer’s publications include six books and more than 80 articles and book chapters on international trade law, global governance, and globalization’s impact on domestic regulation. He is vice president of the American Society of International Law, serves as a representative to the American Council of Learned Societies, and is on the board of editors of the American Journal of International Law. He coordinates the Collaborative Research Network on Transnational and Global Governance at the Law and Society Association. His many awards include a Fernand Braudel Fellowship at the European University Institute in Florence (2009) and a Fulbright Senior Research Fellowship in Rome (2007). UCI Law is a visionary law school focused on training talented and passionate lawyers and driven by professional excellence, intellectual rigor, and a commitment to enrich our communities through public service. UCI Law is a collegial environment, and our faculty comprises accomplished, nationally ranked thought leaders from around the country with a broad range of expertise. More about the Law School is available at law.uci.edu. Wauconda 5/11/2015 — The Commercial Law League of America (CLLA) is pleased to announce that Robert S. Bernstein, of Bernstein-Burkley, P.C., in Pittsburgh, PA, will serve as its 2015-2016 Board of Governors president. This makes Bernstein the only two-term president other than the group’s founder, William Sprague, in 1896. Since joining the CLLA in 1975, Bernstein has held a number of leadership positions, including a previous term as the President of the Board of Governors in 1995-1996. Since his initial position as Secretary of the Young Members Section in 1985, Bernstein has been active within the League’s Governance Structure and held numerous positions within the YMS and Bankruptcy Sections, on the Board of Governors and on a wide variety Committees. While fulfilling his duties as co-managing partner of Bernstein-Burkley, P.C., Bernstein represents other businesses of all sizes and types in many areas of their operation, including representation in reorganization proceedings. With more than 40 years’ experience in the legal community, Robert Bernstein, has extensive knowledge in the areas of collections, bankruptcy and business law. He has been certified as both creditors’ rights and business bankruptcy specialist by the American Board of Certification for more than 20 years – making him one of only a few attorneys to hold both certifications. To schedule an interview Robert Bernstein regarding his CLLA presidency, or any other collections, bankruptcy or credit-related topic, contact Bernstein-Burkley, P.C. Marketing Director, Marissa Luznar, at 412-456-8113 or mluznar@bernsteinlaw.com. Member Steve Kaila of Kohner, Mann & Kailas appeared before the Supreme Court, and was victorious. To read the Kohner, Mann & Kailas press release, please click here. Commercial Law League of America (CLLA) to Host 2nd Annual Capitol Hill Day Legislative Summit in Washington, D.C.
Chicago 2/16/2015 — The Commercial Law League of America is schedule to host its second Legislative Summit in Washington D.C., March 1st – 3rd, 2015. CLLA held its first D.C. Summit in February of 2014 and found the event to be very successful in building relationships with legislators, trade associations, and other nations. This year, CLLA plans to continue to utilize those relationships while focusing on the issue of venue reform. The CLLA supports bankruptcy venue reform because it constructively attempts to rebalance the interests of all parties in bankruptcy by making sure that the bankruptcy reorganization process remains within the regions and communities that have the most significant vested interest in the outcome. The ad hoc group’s written statement is available on the portal CLLA has created on its website for information on venue reform. CLLA’s Hill Day event also provides attendees the opportunity to learn about the important lobbying work CLLA is doing on their behalf and how to get their voice heard in Washington. Additionally, as part of CLLA’s ongoing mission to provide our members with new business opportunities, the D.C. Summit features collaborative face-to-face meetings with key embassy and trade organization representatives. Join CLLA in our efforts on Capitol Hill by contacting us at (800) 978-CLLA or info@clla.org. CLLA has a history of providing members and non-members alike with outstanding educational opportunities, many which provide state required CLE credit. CLLA has presented courses on Venue Reform for many years, as well as hosting a variety of events centered on the topic, such as the 2014 “Great Debate”. 2015 Capitol Hill Day is another such opportunity. For more information on the D.C. Summit or other CLLA events, please contact us or visit our events page. The Commercial Law League of America is pleased to announce that it has chosen Robert Tharnish of Buffalo, Mew York, as its 2014 Robert E. Caine Leadership Award winner. Click here for the press release on the award. The Commercial Law League of America has named James Adelman, of the Pennsylvania-based creditors’ rights law firm Morris & Adelman, as the 2014 President’s Cup award recipient. For more information, please click here to read the CLLA press release. The CLLA debuted its newly revised commercial collection agency certification program on May 14, 2014. Many of the current certification program elements remain the same, including validation of trust accounts, bonding requirements and on-site facility audits. Some of the significant changes include a higher level of program impartiality, with documentation review and facility audits managed by the CLLA and its third-party agent, Acumen Solutions Group, LLC. In addition, with the program, agency certification costs have decreased, in some cases by as much as 33 percent. The decrease is attributed to a more efficient control of the program costs, which has been accomplished without compromising the program’s integrity. For more information, click here to read the press release. 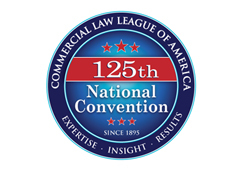 The Commercial Law League of America is pleased to announce that it elected a new Board of Governors last week at its Annual Convention and Midwest Meeting. For more information, please click here. The Commercial Law League of America is pleased to announce that Barry J. Gammons, of The Offices of Barry J. Gammons, PLLC in Nashville, will serve as its 2014-2015 president. For more information, please click here. The Commercial Law League of America is pleased to announced that the strategic partnership it formed recently with Financial Poise has been expanded to provide CLLA members with article publishing opportunities on three bankruptcy websites. For more information, click here. With the support of the Commercial Law League of America (CLLA), Douglas Rosner, a director and lawyer in the bankruptcy group at Goulston & Storrs, made a strong case for bankruptcy venue reform in testimony to a national association on Fri., Nov. 22, 2013. Read a press release on the testimony and venue case here. To help the financial service industry manage the significant impact recent compliance regulations have had on the day-to-day operations of financial institutions and consumer-related businesses, the Commercial Law League of America will host an Aug. 23, 2o13, compliance conference in Charlotte. Co-sponsored by the CLLA’s Southern Region, the dynamic one-day event will feature information and advice from Wells Fargo senior counsel, Consumer Financial Protection Bureau officials (including CFPB’s assistant director for legislative affairs and a member of the CFPB Credit Union Advisory Council) and leading compliance attorneys. The financial service industry, government and legal compliance expert speakers include: Eugene Katz, senior company counsel, Corporate Regulatory Section, Wells Fargo Law Department; Marcus Schaefer, president & CEO, Truliant Federal Credit Union and member of the CFPB’s Credit Union Advisory Council; Jerry Myers, Smith Debnam Narron Drake Sainsting & Myers, LLP; Jim Dougherty, Marcadis Singer, PA.; Manny Newburger, adjunct University of Texas law school professor and partner, Barron & Newburger PC; Emory Potter, partner, Gonzalez Saggio & Harlan LLP; Donald Lampe, partner, Dykema Gossett and Lisa Konwinski, CFPB’s assistant director for legislative affairs. Chicago 5/7/2013 — The Commercial Law League of America is pleased to announce that its members have elected Jeffrey N. Schatzman, of the Miami law firm Schatzman & Schatzman, P.A., as the 2013-2014 CLLA president. Schatzman was elected as the CLLA’s 119th president and assumed office during the 119th National Convention and 83rd Chicago Spring Meeting, held from April 11-13, 2013. Since joining the CLLA in 1991, Schatzman has held a number of leadership positions, including Young Members’ Section and Southern Region chair. He previously served on the Executive Council of the CLLA’s Bankruptcy Section and is a member of CLLA’s Creditors’ Rights Section. Schatzman has also been a member of the Dade County Bar Association, Bankruptcy Bar Association for the Southern District of Florida and American Bar Association. He is admitted to practice law in all Florida state courts, Federal District Courts and Florida Southern and Middle District Bankruptcy courts. Schatzman received his B.A. in political science from the University of Florida in 1986 and his J.D. from the Thomas M. Cooley Law School in Lansing, Michigan in 1989. He was admitted to the Florida Bar the same year. In 1996, Schatzman and his father, Arnold, formed Schatzman & Schatzman, P.A. (www.schatzmanlaw.com). Schatzman directs the firm’s bankruptcy and collection practices and also frequently lectures on bankruptcy and creditors’ rights for the CLLA and other organizations. To arrange an interview with Jeffrey Schatzman about his presidency or a collections, bankruptcy or credit-related topic, please contact Communications Director Erin Brereton at 773.852.9684 or ebrereton@clla.org. Chicago 5/15/2012 — The Commercial Law League of America is pleased to announce that it elected a new Board of Governors at its 82nd Annual CLLA Chicago/Spring Meeting. President: Ivan Jac Reich, Gray Robinson, Fort Lauderdale, Fla.
President Elect: Jeff Schatzman, Schatzman & Schatzman, PA, Miami, Fla. Immediate Past President: James “Beau” Hays, Hays & Potter PC, Atlanta, Ga.
Treasurer: Murray Lubitz, Murray Lubitz Law Firm, White Plains, N.Y.
Attorney Board Member: David Mendelson, Mendelson Law Firm, Memphis, Tenn.
Attorney Board Member: Alisa Stein, Stein & Stein, Haverstraw, N.Y.
Young Members’ Section Representative: Jeff Lippman, Weinstock, Friedman & Friedman, PA, Baltimore, Md. Creditors’ Rights Section Representative: Liviu Vogel, Salon Marrow Dyckman Newman & Broudy LLP, New York, N.Y.
Bankruptcy Section Representative: Peter Califano, Cooper, White & Cooper, LLP, San Francisco, Calif.
Commercial Collection Agency Representative: Bruce Godwin, Williams, Babbit & Weisman, Boca Raton, Fla.
Agency Section Representative: Meg Scotty, Commercial Collection Agency Association, Brennan & Clark, Ltd., Villa Park, Ill.
Attorney Board Member: Richard White, Barber & Batz, Inc., Tulsa, Okla.
Attorney Board Member: Frederic Weinberg, Gordon & Weinberg, Conshohocken, Penn. Law List Publisher Representative: Warren Pinchuck, Columbia Directory, Inc., Boca Raton, Fla.
Attorney Board Member: Barry Gammons, Law Offices of Barry J. Gammons, Nashville, Tenn.
Attorney Board Member: Marc Bressler, Bressler -Duyk Law Firm, Edison, N.J. The CLLA’s Chicago Meeting was held at the Westin Michigan Avenue, 909 N. Michigan Ave., in Chicago from May 3-6, 2012. The board members assumed office on May 5, 2012. Chicago — On May 2, 2012, the Commercial Law League of America’s Board of Governors unanimously voted to change the CLLA business model. The Commercial Law League of America and the Commercial Collection Agency Association will become separate entities with a distinct alignment for further business opportunities on behalf of their respective members. “The CCAA membership looks forward to the new structure and its ability to offer an even stronger strategic partnership with CLLA, an alliance it has had for over 40 years,” says Annette Waggoner, Executive Director, Commercial Collection Agency Association. “This new business model will help both organizations grow and thrive in the modern commercial law market,” says CLLA Executive Vice President Oliver Yandle. An Implementation Committee has been formed to address the structural and contractual changes needed to implement the decision. The committee is expected to present its report to the CLLA Board of Governors by Aug. 1, 2012. Founded in 1895, the CLLA is the nation’s oldest organization of attorneys, collection agencies, judges, accountants, trustees, turnaround managers and other credit and finance experts working in the commercial law, bankruptcy and insolvency field. For more information—and an interactive network of attorneys, law list publishers and agencies working together to serve the credit community—visit www.clla.org or call (312) 240-1400. The Commercial Collection Agency Association has more than 100 member agencies and represents the most prestigious commercial collection agencies in the United States. The CCAA works to elevate the standards of the commercial collections industry by providing educational, legislative, promotional and administrative services to its members. For more information, please visit www.ccaacollect.com or call 847-907-4670. Aug. 8, 2011 — Several members of the Commercial Law League of America met with congressional staff members on Aug. 5, 2011, to share the CLLA’s position on critical bankruptcy issues including entities filing cases in remote jurisdictions and the rules regarding small business reorganizations. CLLA Bankruptcy Section Chair Peter Califano; Immediate Past President Gary Weiner; President-Elect Ivan Reich, Board of Governors’ member Jeffrey Schatzman and Bankruptcy Section Executive Council member Louis Robin were present. The CLLA members and Republican and Democratic Senate and House Judiciary Committee staff members discussed the CLLA’s comments and recommendations on H.R. 2533, which proposes restrictions to the liberal bankruptcy venue provisions permitting entities to file cases in jurisdictions other than where their real principal place of business or primary assets are located. The group also conferred about the development of parameters for establishing and implementing small business reorganizations. Although bankruptcy is not currently a top priority for Congress, it was noted that attention has been given to bills concerning venue issues; an extension of the military exception to means testing and limitations on Section 363 sales — which should see increased attention, including possible hearings, this fall. The same group of CLLA members also met with a representative of the Commercial Finance Association to discuss the possibility of partnering on some legislative issues. Chicago 2/02/2010 — The Commercial Law League of America is pleased to announce that CLLA Executive Vice President Oliver Yandle, JD, CAE, has been nominated for a position on the 2010-2011 Association Forum of Chicagoland Board of Directors. Yandle has been nominated for the position of secretary-treasurer for a one-year term. Per Association Forum rules, if no additional nominations for the position are submitted, along with a written petition, by Feb. 11, 2010, the nominees will be elected by the board and will take office on April 1, 2o1o. Prior to his work with the CLLA, Yandle served as senior director for association management company SmithBucklin, where he was responsible for two nonprofit associations, and served as the executive director for the International Association of Defense Counsel. Yandle received his law degree from the Washington College of Law, American University, Washington D.C., and his undergraduate degree in journalism from Loyola University of the South in New Orleans. In addition to being a certified association executive, Yandle has worked with the Association Forum since 2002 and received the Distinguished Service Award from the organization in 2007. In all, eight candidates were nominated for open Association Forum board positions. Other nominees included H. Stephen Lieber, CAE, president and CEO?of Healthcare Information and Management Systems Society, for chair (automatically succeeding from chair-elect); Elaine Weiss, J.D., president and CEO of the Illinois CPA Society, for chair-elect (automatically succeeding from secretary-treasurer); Mary Lynn Fayoumi, CAE, president & CEO of The Management Association of Illinois, and Larry Robertson, CAE, senior director of human resources at the American Society of Gastrointestinal Endoscopy, for regular member director with a three-year term; Dave Bergeson, Ph.D., CAE, of the Account Executive Association Management Center, for regular member director with a one-year term (Bergeson will also fill Yandle’s unexpired term); Regina Ward, senior vice president of Harris Bank, for supplier partner member director with a three-year term; Brian K. Willard, CAE, president of BK Solutions, for supplier partner member director with a one-year term. The mission of the Association Forum of Chicagoland is to “advance the professional practice of association management.” Founded in 1916, Association Forum serves 47,000 association professionals whose efforts serve more than 37 million members and generate $22 billion in global annual expenditures. Visit www.associationforum.org. The FTC has just issued its report on the 2007 Fall Workshop on debt collection. To view the report, please click on this link: http://www.ftc.gov/opa/2009/02/fdcpa.shtm. Included in the discussions were the issues addressed in the White Paper submitted to the FTC by our own CLLA members.